TRENTON-- Independent U.S. Senate candidates met in Trenton to discuss immigration, national security, and foreign policy Wednesday evening at Mercer County Community College. 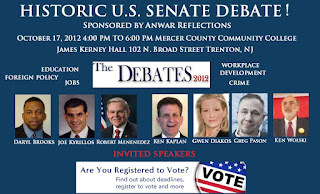 Anwar's Reflections-- a Trentonian affiliate-- hosted and moderated its second U.S. Senate Debate at Mercer County Community downtown at its James Kerney Campus. The debate was designed to increase voter turnout and raise awareness about the upcoming General Election. All senate candidates were invited, but mainstream candidates Democrat U.S. Senator Robert Menendez and Republican Joseph Kyrillos did not attend. During the debate, all three independent candidates that did attend, Greg Pason of the Socialist Party, Daryl Brooks of the Reform Nation Party, and Steve Welzer of the Green Party in place of Ken Wolski, said that military spending should be reduced and that our country should instead be invested in a jobs bill or some form of education reform. Later, during the debate, the candidates went on to discuss illegal immigration. Greg Pason of the Socialist Party said that he supports the DREAM Act, a narrowly tailored bill to give undocumented students a chance to earn legal status if they came here as children, are long-term U.S. residents, have good moral character, and complete two years of college or military service in good standing. Daryl Brooks of the Reform Nation Party had an opposing view. He said that "illegal is illegal" and that he did not support the DREAM Act. Steve Welzer of the Green Party said that he supported stricter enforcement of the immigration laws already on the books. Indeed, from my observation, the event was a lively and engaging. However, the turnout was not as expected. Many were invited, but few showed. With rising prices, unemployment, and lack of healthcare afflicting the lives of many, it is a wonder why more people didn't come out to hear what the candidates have to say. Do the people really want change? Questions remain...Yet, in any event, the struggle continues. For more information on the upcoming election, visit VoteSmart by clicking here. TRENTON-- Independent third party U.S. Senate candidates came together Wednesday afternoon to discuss some of the issues in Trenton, but the two major political candidates were nowhere to be found. 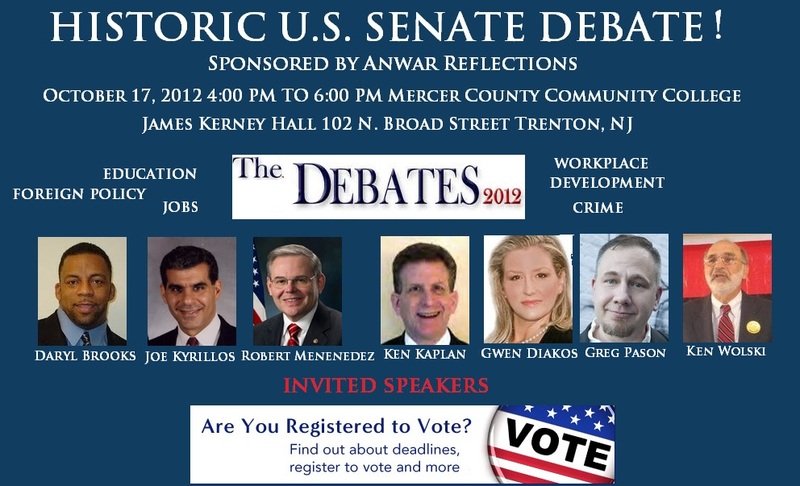 Wednesday night, Anwar's Reflections-- a Trentonian affiliate-- hosted a U.S. Senate Debate at Mercer County Community College downtown at their James Kerney campus to inform the public about the upcoming general election November 6th and to discuss jobs, the economy, and the budget deficit, among other things. 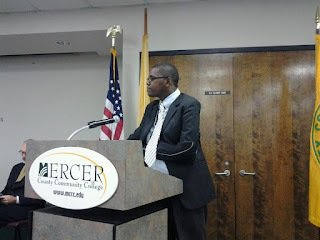 The debate was co-moderated by Delonte Harrod, a graduate student and photographer, and Anwar Salandy, a local blogger. All candidates were invited, including Democratic Senator Robert Menendez and Republican candidate Joseph Kyrillos, but neither Menendez nor Kyrillos were in attendance. The debate's participants made note of Menendez and Kyrillos absence. Libertarian candidate Kenneth Kaplan said, "I want to criticize Kyrillos and Menendez for not being here today, its shows what they think about the people of New Jersey by not taking on the opposition, by not exchanging ideas with us". Reform Nation candidate Daryl Mikell Brooks went on to say that, "They didn't show up and I'm disappointed". Menendez and Kyrillos met in Trenton just two weeks ago for the 101.5 FM debate, but their absence last night was conspicuous. Indeed, what does their absence signify? The question becomes: Are they really concerned about issues and problems affecting the people in inner cities like Trenton? If they are, then why didn't they show up? Sure, independent candidates lack the financial resources and backing that Republicans and Democrats have, but don't they deserve a voice at the table? In a phone interview, U.S. Senate candidate Inder Soni told me that he wants to challenge Menendez and Kyrillos to a debate in Trenton. A follow-up debate is scheduled for next Wednesday at Mercer County Community College located downtown Trenton inside Kerney Hall from 6 to 8 pm. All candidates are invited. Socialist Party candidate Greg Pason, Green Party candidate Ken Wolski, Reform Nation candidate Daryl Mikell Brooks, and Libertarian candidate Kenneth Kaplan were at the first debate and have confirmed that they will attend the second debate scheduled for next week. For more information on the election, click here. For more information about next week's event, contact Anwar Salandy at 609.968.6114. You can also reach him by email at anwarsalandy@ymail.com. TRENTON--"Anwar's Reflections"-- a Trentonian affiliate, in association with Occupy the Hood NJ will be hosting a U.S. Senate debate October 17th at Mercer County Community College from 4 to 6 pm to combat voter apathy. This debate was born out of a concern for voter apathy.Voter apathy refers to a situation where eligible Americans choose to boycott participation in elections, for whatever reason. This November 6th, the President, U.S. Senators, and different members of the legislature will all be on the ballot. According to Real Clear Politics, 56.2% of the people say that the country is going in the wrong direction. Indeed, as more and more citizens wrestle with unemployment, rising prices, and a lack of healthcare, it would seem that for this year's election, the stakes could not be any higher. However, whether people will actually turn out this year is another question. Alas, even as it is recognized that voter turnout has increased over the last three presidential elections according to CBS News, there is still this nagging sense that more and more people are showing a lack of interest in politics or the political process due to busy schedules, cynical resignation, or perhaps even due to their sheer confusion about how the voting process works, it makes one wonder how many people will actually turn out to vote. And to make matters worse, across the nation, there have been changes made to voting laws that could potentially affect "minorities", the elderly and student populations. Many of these laws require that voters present identification at the time of voting. According to TechnicianOnline Staff Writer Lindsey Rosenbaum, "these laws were mainly implemented by Republican congressmen in an attempt to fight voter fraud, but some voting rights advocates see this instead as voter suppression targeting main Democratic demographics". For more on this issue, click here. With these sorts of issues looming, "Anwar's Reflections"-- a Trentonian affiliate, in association with Occupy the Hood NJ, have decided to hold a U.S. Senate debate at Mercer County Community College's Kerney Hall located in Downtown Trenton October 17th from 4 to 6 pm. The event is designed to raise awareness about the upcoming election and to encourage involvement in the democratic process. Information on how to register to vote will be available for those that need it. During the debate, we will be discussing a variety of issues affecting Mercer County and urban centers like Trenton. We will address issues like jobs, workforce development, and the role of government. If you are interested in submitting debate questions, click here. Greg Pason of the Socialist Party, Inder Soni, Kenneth Kaplan of the Libertarian Party, and Daryl Brooks of the Reform Nation Political Party have all confirmed that they can attend. Democratic Senator Robert Menendez and Republican candidate Joe Kyrillos have also been invited, but as of today, they have not confirmed their attendance. For more information on the event, contact Anwar Salandy at 609.968.6114 or email him at anwarsalandy@ymail.com. TRENTON-- Local activist makes yet another bid for U.S. Senate this November. Longtime Trenton resident and political firebrand Daryl Brooks sat down with Anwar's Reflections-- a Trentonian affiliate-- to discuss his candidacy Tuesday afternoon. During the nearly one hour interview, Brooks spoke about issues like education, jobs, and immigration. The political malcontent took no time in calling out a number of community leaders and activists for what he deemed to be their failure in addressing issues like crime, education, jobs, and prisons. 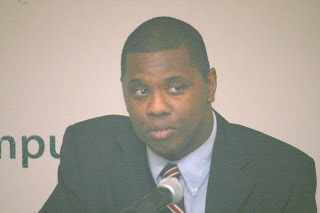 From West Ward Councilman Zachary Chester to Trentonian talk show host Darren Freedom Green, Brooks took no prisoners as he spoke about the city's crisis of leadership. Brooks went on to say that these leaders are too busy singing, dancing, and having 'cookouts' to tackle today's problems. He said today's leaders are weak and "have no ideas". Aside from the community's woes, Brooks also spoke about two hallmarks of his political campaign, immigration and education. The outspoken activist is no stranger to running for political office. In the past, he ran two senate campaigns that proved unsuccessful. Over the year's, the local activist's political career has been marred by a 1995 conviction for lewdness, endangerment of a child, and assault. At that time, Trenton, NJ police and prosecutors claimed that Brooks flashed two adolescent aged girls. Since day one, Brooks has maintained his innocence. After being released from prison, Brooks published an audiobook chronicling his life. Over the years, the Trenton activist has made it a point to fight for issues affecting the prison industrial complex, violence, and other forms of injustice. He is currently a member of the Tea Party and has affiliations with Occupy the Hood NJ and Occupy Trenton. For more information on Brooks or his campaign, visit his website by clicking here. 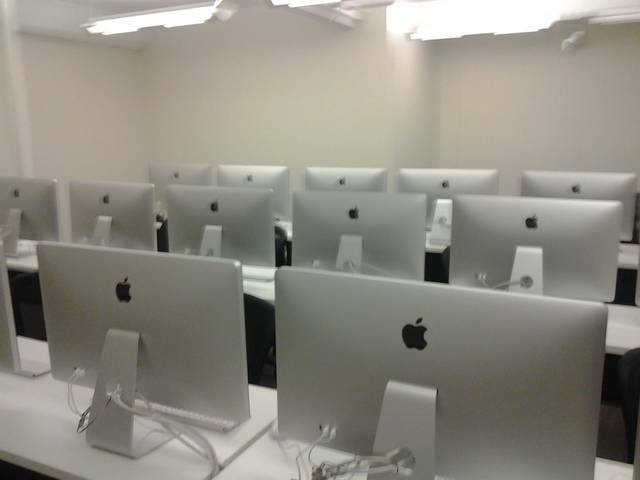 TRENTON-- Local community college unveils new changes at their Trenton campus. Anwar's Reflections-- a Trentonian affiliate-- attended Mercer County Community College's (MCCC) Special Open House and Celebration Thursday afternoon at their downtown James Kerney Campus to take a tour of the new facilities. As a former student and MCCC alumni, I felt the need to stop by and check out the changes the College has made. From reviewing the campus, the College has added a new one-stop registration and advisement center known as The Commons. On top of this, a new career center, science labs, and study areas were added to the current building. Across the street from the College lies Trenton Hall, a facility with new classrooms, a study lounge, an art studio, and a Fashion Design Laboratory. During my tour, I was guided by two of the College's nursing majors that said they liked the new changes. According to the College's website, students can now complete their associate's degree in Liberal Arts entirely at the Downtown Trenton Kerney campus. The College was originally an Evening Drawing School, but then turned into MCCC in 1966. The school then expanded its reach by constructing the West Windsor campus six years later in 1972. With these changes and enhancements, the College sought to build upon this history by better meeting the needs of the community. MCCC President Patricia Donuhue said, "With expansion and improvements downtown, we will be able to serve more city and county residents, including state workers that are interested in evening or lunchtime classes". Kerney Campus Provost Monica Weaver went on to say that the College is "bringing programs that have a direct link to the economic success of our region". During the College's celebration ceremony, both current students and alumni spoke about the impact that the College has had on their education. As a former student, I can definitely say that I think the changes were well needed. For years, the downtown campus lacked a feel and look of modernization. So on an aesthetic level, I think the changes are both stylish and attractive. From a community need standpoint, I think the addition of Trenton Hall will definitely help train and educate tomorrow's leaders in skills that are actually needed in the workplace. Trenton Hall is designed specifically for Fashion Design and Art majors, but other students can use the facility as well. Its highly important that we train and educate people so that they are equipped to handle 21st century jobs. I think MCCC's changes are a good move in that direction. For more information on the College, call (609) 586-4800 or visit their website by clicking here.